Carbon fiber frame guards Sold as a set Fits the following Yamaha models: YZ125 2005-2011 YZ250 2005-2011 Please note: The image displayed is representative of the item, but may vary depending upon your specific model. Carbon fiber frame guards Sold as a set Fits the following Yamaha models: YZ250F 1998-2002 YZ400F 1998-2002 YZ426F 1998-2002 Please note: The image displayed is representative of the item, but may vary depending upon your specific model. Carbon fiber frame guards Sold as a set Fits the following Yamaha models: YZ250F 2006-2009 YZ450F 2006-2009 Please note: The image displayed is representative of the item, but may vary depending upon your specific model. 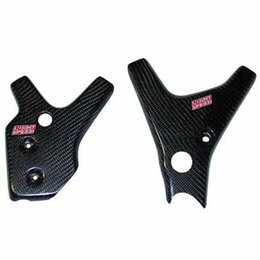 Carbon fiber frame guards Sold as a set Please note: The image displayed is representative of the item, but may vary depending upon your specific model. Carbon fiber frame guards Sold as a set Fits the following Yamaha models: WR250F 2007-2011 WR450F 2007-2011 Please note: The image displayed is representative of the item, but may vary depending upon your specific model. Carbon fiber frame guards Sold as a set Fits the following Honda models: CRF250R 2010-2011 CRF450R 2009-2011 Please note: The image displayed is representative of the item, but may vary depending upon your specific model. Carbon fiber frame guards Sold as a set Fits the following Kawasaki models: KX125 2003-2005 KX250 2003-2004 Please note: The image displayed is representative of the item, but may vary depending upon your specific model. Carbon fiber frame guards Sold as a set Fits the following Kawasaki models: KLX450 2008-2011 KX450F 2006-2008 Please note: The image displayed is representative of the item, but may vary depending upon your specific model.